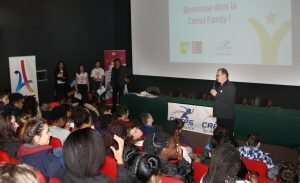 PR – An agreement between the Carte Jeunes Européenne program and the CREPS IDF has been launched to increase the EYCA member’s impact on young people. Paris, February 16th 2017 – The Carte Jeunes Européenne program, under the aegis of the IJD France Association, releases today its preferred partnership with the CREPS Île-de-France to encourage young athletes’ information, participation and mobility in Europe. The event took place at the auditorium of the Expertise Sport Regional Center (CREPS d’Île-de-France) located in Châtenay-Malabry, close to Paris. During this evening, 180 young athletes of the institution received their Carte Jeunes Européenne and attended the presentation of the Carte Jeunes Européenne program, that give them the opportunity to benefit from thousands of advantages across Europe. 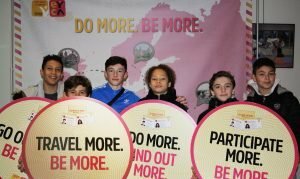 With more than 60,000 benefits in Europe, the Carte Jeunes Européenne is a program – supported by the Council of Europe – which has been promoting young people’s mobility in Europe over the last 30 years, offering them discounts in various fields such as sports, leisure, transport, culture and housing. This program was launched in France in September 2016 by the Association IJD France and adresses young people between 12 and 30 years old. Based on shared values ​​and common missions, the IJD Association and the CREPS d’Île-de-France established ties for the benefit of young people in order to encourage the development of physical activities as well as cultural openness towards European countries. This ceremony to offer the high-level athletes their Carte Jeunes Européenne is only the first step of this major partnership. As of the end of March, young trainees in sports and animation courses at the CREPS d’Île-de-France will also receive this new passport to thousands of activities in Europe. The IJD France Association also intends to develop this partnership at national level by collaborating with the other regional CREPS with the same objective: to promote youth mobility in Europe. One of the major strengths of this collaboration is also to give more visibility to the respective actions of the two entities towards young people, in particular through the organization of events and joint activities. “The Carte Jeunes Européenne program is very supportive of the CREPS activities to promote the practice and the values ​​of sport. Sport has been a mainstay of our youth program for 30 years” says Julián Villarroya, President of the IJD France Association. “As a major sports partner of the Carte Jeunes Européenne, the CREPS d’Île-de-France wants to share its dream of openness on a connected world” adds Michel Cogne, Project Manager. 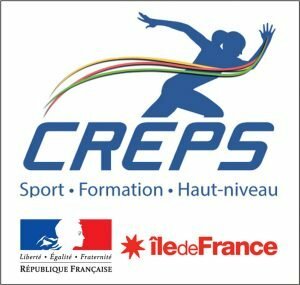 Regarding the CREPS d’Île-de-France: The Expertise Sport Regional Center situated in the region of Île-de-France (CREPS IDF) is a public national institution lead by the Sport and Youth Ministry. There are two structures situated at Châtenay-Malabry (92) where it operates the main activities and Pontault-Combault (77) where it operates the courses for the east Francilien. The CREPS IDF receives more than 1200 young high-level athletes and trainees in skills training. Regarding the Carte Jeunes Européenne: The Carte Jeunes Européenne program, led by the IJD France Association, is dedicated to investing in the development of young people, irrespective their nationality, through education, sports and mobility in Europe.